Temperature and salinity measurements (averaged between 2010 and 2014) from several satellites, including ESA’s SMOS mission, have been used to map ocean alkalinity, the ability of a solution to neutralize acids and thus resist to changes in pH. Using satellite measurements, researchers a team of international collaborators are developing new methods to quantify ocean acidity around the globe. 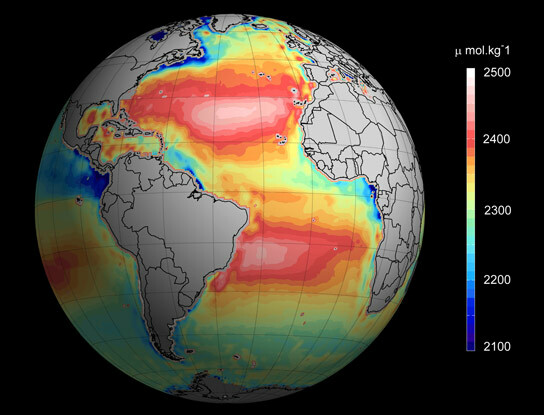 With fundamental changes happening to the chemistry of the world’s oceans, salinity information from ESA’s SMOS mission is being used with other Earth observation data to obtain information on ‘the other carbon dioxide problem’ – ocean acidification. This new step is set to advance the way ocean biologists and climatologists study the oceans. More than a quarter of the carbon dioxide we release into the atmosphere every year is soaked up by the oceans. Initially, this may appear to be a good thing, tempering global warming, but there is a downside. As more carbon dioxide dissolves into the oceans, the more acidic the seawater becomes – with extremely damaging effects. Over the next century, ocean acidification has the potential to alter many marine ecosystems so that sea life is affected as well as fisheries – a basic food source on which many rely. Carefully assessing changes in ocean acidity is essential, and particularly because these changes are not uniform around the world. Until now, this information has only been available from measurements taken from research vessels and laboratory experiments, which is clearly limited. Researchers at the University of Exeter, Plymouth Marine Laboratory, Ifremer, ESA and a team of international collaborators are developing new methods that allow ocean acidity around the globe to be quantified using satellite measurements. Piecing together salinity data from SMOS with satellite sea-surface temperature measurements and additional auxiliary data, it is possible to work out the pH of seawater and therefore provide accurate information to help address the growing problem of ocean acidification. Roberto Sabia, Earth observation data engineer at ESA, explains, “By unifying various different efforts, for the first time we are now able to use satellites to systematically determine the pH of surface seawater. Jamie Shutler from the University of Exeter, who is leading the research, added, “Satellites are likely to become increasingly important for monitoring ocean acidification, especially in remote waters. This research, which is being carried out through ESA’s Earth Observation Support to Science Element (STSE), was published today in the journal Environmental Science and Technology. Be the first to comment on "Satellite-Based Assessment of Ocean Acidification"